Saturday, October 1. – 31th Evangelical Olympic Games at the Joan Serrahima Stadium in Montjuïc (Barcelona), organized by the Pocket Testament League – Spain. Saturday, October 8. – Opening ceremony of the 2016-2017 course of the Evangelical Center for Biblical Studies (CEEB, in Spanish) – Evangelical Biblical School (EBE, in Spanish) and graduation ceremony for the previous year. The event took place in our church. Saturday, October 15. – The “AGDE 20th anniversary celebration”. The Evangelical Documentary Graphic Archive (1996-2016) organized the event at the Ebenezer Church on Gaiolà passage. The program included the conference “The Reformation in Spain, 300 years: from Rodrigo de Valer to Luis Usoz y Río”, by Frances Luttikhuizen (scholar and writer specializing in the subject). Thursday, October 27. – The Consell Evangèlic de Catalunya (CEC) celebrated its 35th anniversary at CaixaForum Centre in Barcelona. The American singer Steve Green participated in the event. He was accompanied by a choir made up of members of our church, the Ictus Choir (from la Torrassa) and the Al·leluia Choir (from Sabadell). This combined choir performed the rehearsals in our church, coordinated and conducted by Rubén López. Saturday, November 12. – Jovenevan 2016, meeting for young evangelical people. The event was held at Sant Joan Bosco School in Horta (Barcelona city) under the motto “Passionate”. Saturday, November 26. – Our church Choir offered an Advent concert at the Centre Cultural Calisay in Arenys de Mar. Sunday, November 27. 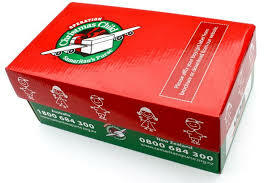 – Our church participated in the“Operation Christmas Child” for giving some shoeboxes filled with gifts for children in underdeveloped countries. -Sunday 27 at 18:00 p.m. in the Evangelical Church of Verdi Street: “What Made the West Better”. If you want to listen to the conference click here. -Monday 28 at 9:30 a.m. in the Bookstore ABBA: “Truth and Tranformation”. -Monday 28 at 13:00 p.m. in the classroom B2 in the Faculty of Mathematics (central campus) of the University of Barcelona: “The Book That Made Your World”. From Thursday 8 to Saturday 10 December. – Congress for young people “I Believe in You” in La Viña Church in Barcelona. Itiel Arroyo, Laia Gállego, Oscar Pérez, Loida Muñoz, Jaume Llenas, Josué Enfedaque, Valeria Esteban and Alex Sampedro shared the Word in the plenary sessions. More than 15 workshops were also organized with the participation of Dani Zoppetti, Roberto Cano, Noa Alarcón, Esther Vidal, Sammy Planes, José Luis Ruz, Leonor Pons and Wilson Vásquez. Sunday, December 11, in the morning. – As part of the Sunday service, we celebrated a thanksgiving event in our church on the occasion of the 60th wedding anniversary of our pastors Pedro and Anita. Sunday, December 11, in the afternoon. – We had a special Praise service with musical performances from our church Choir and Praise Group. Tuesday, December 13. – The women of the FIEIDE-Catalunya churches celebrated their traditional Christmas Meeting in our church. The message was given by Cesca Planagumà about “Christmas in family”. Friday, December 16, from 7:00 p.m. to 9:00 p.m. – Last meeting F-JOVE of the year. Each Friday Youth for Christ Barcelona organizes in our church some meetings for young people from 18 to 25 years, called F-JOVE. It is a warm and pleasant space where you can praise God and reflect on issues that we face, such as work, studies, etc. The purpose is to be able to grow together and see what God wants to say in each of these aspects. Sunday, December 18, at 12:00 p.m. – The evangelical television program “Buenas Noticias TV” broadcast on La2 of Spanish Television a Christmas Service. It was recorded at the Salem Evangelical Church in Madrid. The program director, José Pablo Sánchez, was in charge to conduct the celebration. The singer and songwriter Marcos Vidal, pastor of the host church, presented the biblical message. The musical part included María Ayo, Miriam Vidal and the worship group of the Salem Church. Sunday, December 18, from 12:00 p.m. to 2:00 p.m. – Our church Choir participated in the traditional concert “Advent Coral at the Alcaldia” with others choirs from Sants, Montjuïc and la Bordeta neighbourhoods. The event took place in the District Plenary Hall (104 Creu Coberta Street – Barcelona). Sunday, December 18, in the afternoon. – The Sunday School children had their Christmas Meeting for the whole church. The theme they offered us was “In Search of Jesus”, second part of the work they did last year. It was a participatory and dynamic proposal to meditate on the person of the Lord Jesus. Sunday, December 25, at 11 a,m. – Special Christmas Worship service. Saturday, December 31. – End of Year Supper (from 8:30 p,m.) and Worship service to receive the New Year 2017 (at 11:00 p.m.) with musical participation, Bible readings and prayer.